After the success of the Bluetail, our focus was on the Brambling. Next morning, we woke up to rain. On these type of days I generally don’t even go out of the house let alone take out my camera. Time was short so after breakfast off we went. A short drive through traffic and we were at Laurel and West 17th in Vancouver. We went to the back lane of the house and looked around the yard, and saw many birds, including Anna’s Hummingbirds, House Finches, Black-capped Chickadees, Song, Fox, Golden-crowned and House Sparrows, and Juncos but not the Brambling. There was a man standing in the laneway and we asked if he’d seen the bird. “it was just here 5 min ago” he replied and I thought here we go again, another hour wait for it to return. About 1 minute later up it came from inside the bush/tree/shrub and put on a show for us. It never came out in the clear but species photo #633 for my files, was in the books. 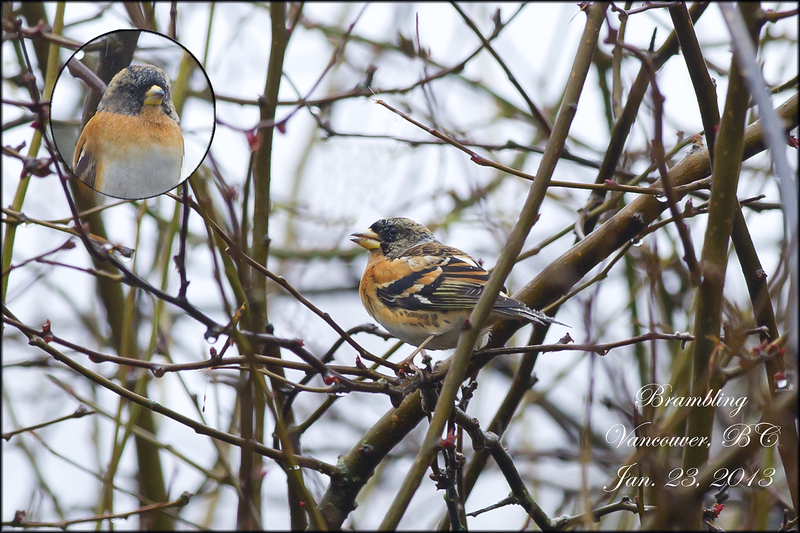 Bramblings are a Eurasian species common but irregular in the Aleutians. Regularly seen most years somewhere on the west coast in winter. The photo is crappy but they all count.